One of the most difficult aspects of carving is to keep and maintain a razor’s edge on your carving tools. If you like to use sharp knives, hand tools, and like a razor sharp edge, this revolutionary new sharpening system called “JoolTool” is the system for you. After 25 years of carving and searching for the right stone, jig, gauge, or grinder, I was reluctant to make a large purchase for a newer/larger unit that would take up more space in my shop. But when I tried the system at the Fox Chapel Open House in September, using my own gouge and pocketknife, I was hooked. The speed and accuracy of the tool was amazing! Now everything in my house with the slightest resemblance to a sharp edge has been re-sharpened to perfection. Once you learn what is required, creating the burr and angle you want is quick and easy. The tool is designed to spin the 3M Trizact NINJA discs at an appropriate speed. The Ninja discs are designed to be see-through, which makes sharpening much easier. Before I made the investment in this tool, I tested it on a Flexcut gouge to see for myself just how powerful the JoolTool sharpening system is. I was having a difficult time getting an edge on my palm gouges, so David Bennet of Flexcut showed me how they sharpen their tools with the system. I took the time to get to know the unit at the show. We ruined the edge on a fishtail gouge and proceeded to restore the angle and bevel on the gouge, and sharpen it to a polished edge. This was the best edge I have ever put on a gouge! Right then, I knew this new system was going to be headed home with me on the plane! There are a wide range of sharpening grits available for this machine. The progression of grits helps to maintain the ever important bevel. The polishing wheel is also a very valuable feature that helps take the edge to a higher, polished level. I am also pleased with the pad life of the 3M Trizact discs. For the amount of money you spend on individual tools, you owe it to them to maintain a razor-sharp edge. Bar none, the JoolTool is the most useful tool in my shop. 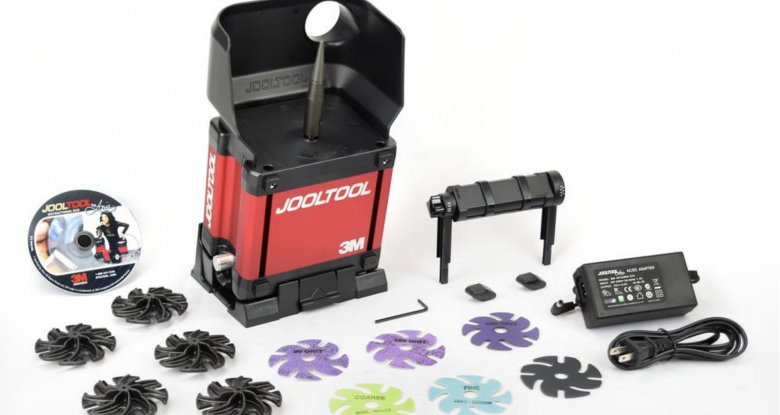 The JoolTool starts at $489.99. For more information contact them at 888-337-1230 or visit www.jooltool.com.